Our Management Team is second to none. They care about their people and through the development of good structure and systems they help improve customer service, consistent quality, efficient and hard work ethic with attention to detail. Working together as a team creates a good working environment and ensures high levels of customer service through commitment to clear communication. Charlie Wahlgren, Shop Manager of for all Top Gun Pressure Washing locations. Charlie served in the US Army for Six years, trained as a diesel mechanic among other technical areas such as gas motors, electrical, hydraulics. After serving, he continued increasing his skills and experience for 15 years before joining Top Gun, supervising and managing up to 50 other employees. Starting in 2006 Charlie came onboard the Top Gun team. 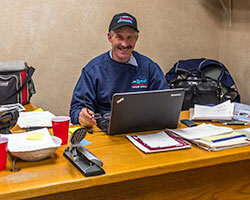 He works very hard to ensure the increasingly large number of rigs, trailers and equipment are running at maximum capacity. He manages the shop mechanics at all shops, training them and developing new systems to enhance our efficiency and preventative maintenance programs. Charlie holds a Class A Commercial Driver's License and Heavy Duty/Air Brake Certification. He is knowledgeable ats a Journeyman level in the following areas: Air, Hydraulic, Combination Vehicle Brakes, Cummins, Cat, Engine Rebuild, Intake/Exhaust, Turbo, Air Systems, Cooling System, Electrical System, P.T.O., Hydraulics, Planetary Drive, Clutch, Transmission, Drive Train, Suspension and Tires. Strong welding and fabrication skills. Charlie's experience also includes the use of: Torch, Air Arc, Arc and Mig welding, Oxy/Acc welding and bucket/rebuilds as well as a Field Service Mechanic. 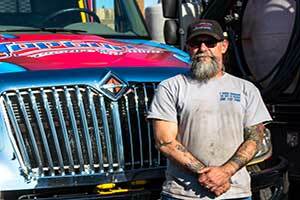 Charlie is able to fix anything mechanical and keeps Top Gun Pressure Washing's equipment in tip-top shape. 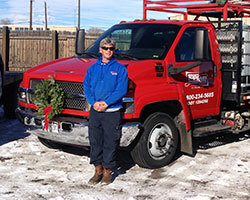 Stephanie White, Sales Manager of Top Gun Pressure Washing, Inc.
As both the owner and top sales representative for the company, Stephanie has spurred Top Gun to achieve an average 26% annual growth rate since its inception, launching it to the top of its industry in both Colorado and Wyoming. 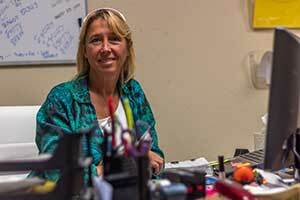 As a member of the Chamber of Commerce, Better Business Bureau, and Vistage Stephanie continuously strives for growth and a continued service to the community. With a family of five, living on an Elk Ranch in the Colorado Rocky Mountains, she enjoys the great outdoors with a passion for hiking, off road four wheeling, sailing / boating, snow skiing, white water rafting and photography. 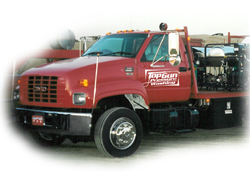 As Top Gun grew from a one rig service provider to a company that utilizes over 20 rigs, Peter's focus shifted to identifying machinery that kept ahead of industry trends as new technology such as vacuum systems, scrubbers and sweepers were developed. These advancements in technology allowed him to customize each rig with washers and equipment adequate for various services such as industrial parking. Today Peter dedicates his time to doing pressure washing training programs at all levels for all levels of Top Gun employees to ensure the quality that Top Gun promises is delivered. He continues to research and develop new technologies for his rigs with highly effective operating systems for our experience staff to maximize their performance. Meet the Rest of The Top Gun Team: Sales & Marketing, Field Team, and Administrative.